The truth be told, the career of the finest girls’ goalkeeper in Lyndhurst High School history began innocently – as she believes – as a demotion for being a poor soccer player. Castagnetti said that she tried her hands in a lot of sports growing up. Now, almost 10 years later, Castagnetti is as good as it gets in net. The Golden Bear senior has no peers in northern New Jersey. Castagnetti has enjoyed a ton of fun this season for the Golden Bears. She compiled an incredible streak where she collected 10 consecutive shutouts. She has allowed just two goals all season in 15 games, with the Golden Bears’ record standing at 13-2. 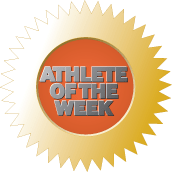 For her efforts, Castagnetti has been selected as The Observer Athlete of the Week for the past week. Castagnetti has come a long way in her four years as the starting net minder for the Golden Bears. Castagnetti then started to take the sport in a different light when she joined the Princeton Soccer Academy club team. It also helped having a coach in the family. Although her father, Joe, never coached soccer, the former Lyndhurst head football coach and current football assistant played a major part in his daughter’s development. Castagnetti’s development as a goalie certainly helped the Golden Bears. Hykey is impressed with Castagnetti’s ability to use her feet. Castagnetti is not just a student of soccer. She’s also a great student in the classroom as well. She’s currently on pace to become the Lyndhurst Class of 2019 valedictorian with an astounding 4.37 grade point average. Castagnetti decided upon Holy Cross when she was just a sophomore. Castagnetti is unsure, but she believes that she will major in biochemistry in college with medical school a strong possibility. “I think my degree will give me options,” she said. Castagnetti said that the shutout streak was nice as it was happening, but the pressure to keep it going began to mount. The Golden Bears’ defensive corps includes center backs Maggie Fadera and Gia Estrella, along with defenders Rachel Bocage, Alex Tortorella and Julia McCann. Bocage has been a teammate of Castagnetti since they were eight years old. Hykey knows that Castagnetti is leaving an immense legacy at the school. The Golden Bears have yet another Castagnetti on the roster – freshman midfielder Francesca, Isabella’s younger sister. There’s one thing that’s left for Castagnetti to conquer. Needless to say, this season has been a blast for the kid who was once stuck in goal because she thought she wasn’t good enough. Well, she’s more than good enough now. That’s the true legacy of Isabella Castagnetti.